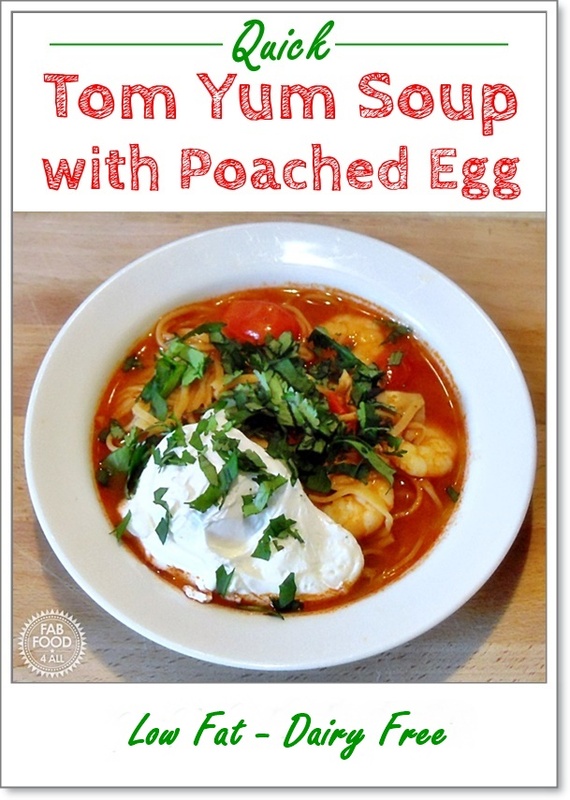 I had been meaning to post my Quick Tom Yum Soup with Poached Egg recipe for a long time. I used to make it all the time and then just fell out of the habit. Today I noticed a lonely jar of Tom Yum Soup Paste at the back of the cupboard and remembered I had a few mushrooms that needed using up so knew exactly what to do. It was lunch time but none of us had had breakfast so I was going to do poached eggs on toast for my daughter. 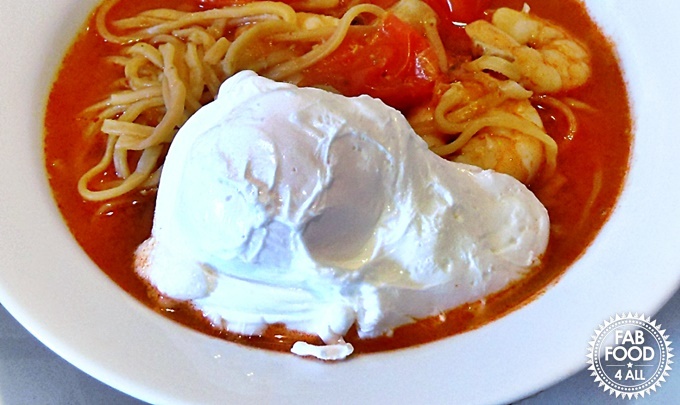 Then decided that I would add a poached egg to the soup as it’s not a million miles away from what the Chinese do with their omelette on dishes! 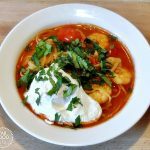 Not only is this soup really tasty and spicy but it’s probably the quickest soup in the west and the east! Just add a garnish of chopped coriander and enjoy! 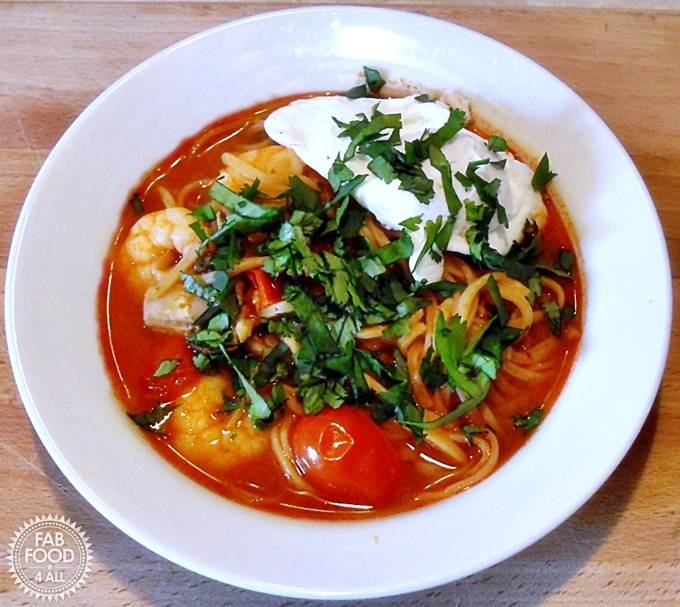 A hot and spicy soup with king prawns, noodles, tomatoes, mushroom and a poached egg with a coriander garnish. Place all the ingredients except the coriander, eggs and vinegar into the boiling water (use a kettle) bring to the boil and then simmer until the noodles and prawns are cooked (about 4 minutes). Meanwhile lower the eggs one by one into a saucepan of boiling water with a splash of vinegar. Cook for 4 minutes for a slightly runny centre, then remove with a slotted spoon and drain on some kitchen paper. 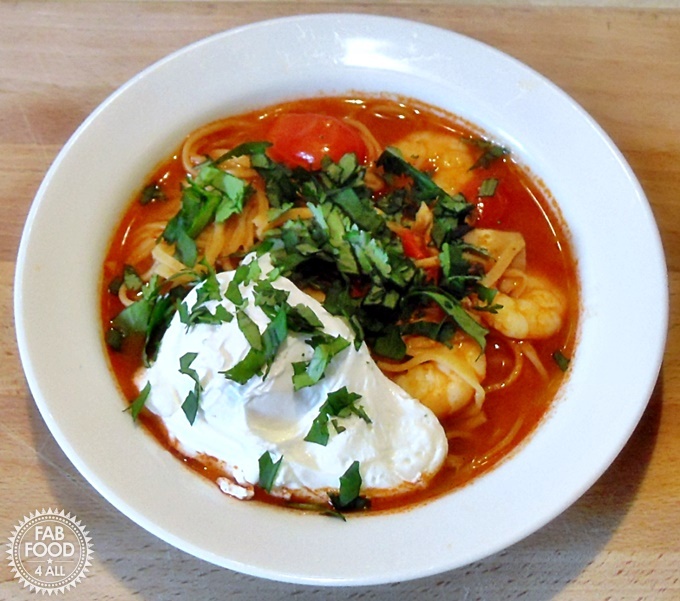 Divide the soup between 3 bowls, place the egg on top and garnish with the chopped coriander. I’ve not heard of tom yum soup before. Where have I bean. Sounds delicious, especially with the egg. Sounds like a wonderful, light and tasty soup, Camilla! I’d love to try it! They do it on Chines soup – well omelet anyway!